A recent fact finding mission into the fatal impacts the extractive industry causes in West Papua once again highlighted the widespread devastation mining activities have on the indigenous population and on the local ecology. The Brisbane Archdiocese’s Catholic Justice and Peace Commission’s report comes to the conclusion that the ruthless mining policies promoted by the Indonesian regime, a legacy of oppression of the people of West Papua, together with the environmental devastation amount to a “slow motion genocide”. A recent fact-finding mission (by the Brisbane Archdiocese’s Catholic Justice and Peace Commission) described a “slow-motion genocide” taking place in West Papua, warning that its indigenous population is at risk of becoming “an anthropological museum exhibit of a bygone culture”. Since the Suharto dictatorship annexed the region in a 1969 UN referendum largely seen as a fixed land grab, an estimated 500,000 West Papuans have been killed in their fight for self-rule. Decades of military and police oppression, kidnapping and torture have created a long-standing culture of fear. Local and foreign journalists are routinely banned, detained, beaten and forced to face trialon trumped-up charges. Undercover police regularly trail indigenous religious, social and political leaders. And children still in primary school have been jailed for taking part in demonstrations calling for independence from Indonesia. “There is no justice in this country,” whispered one indigenous villager on condition of anonymity, looking over his shoulder fearfully. “It is an island without law.” Today, indigenous tribes such as the Kamoro and the Amungme claim their communities have been racked with poverty, disease, oppression and environmental degradation since the mine began operations in 1973. “We are a coastal people, and we depend on the environment,” says the Kamoro’s chief, Hironimus Urmani, in Tipuka, a lowland village down-river from the Grasberg mine. “Nature is a blessing from God, and we are known by the three Ss: sago [trees], sampan [canoes] and sungai [rivers]. But life is very difficult now.” Urmani motions to the river opposite, languishing green and motionless. He claims that tailing sediment from the mine has raised the riverbed, suffocating the fish, oysters and shrimp on which the Kamoro diet and economy are traditionally based. A 2012 report from Earthworks and MiningWatch Canada asserts that mine waste from Grasberg has “buried over 166 square kilometers of formerly productive forest and wetlands, and fish have largely disappeared”. Although most Kamoro still try to eke out a living fishing and foraging for food, they struggle to find paid work, says Urmani. “We need to earn money. But now we face major competition from non-Papuan migrants.” Locals fear that the government’s controversial transmigration programme, which resettles Indonesians from high-density islands such as Java to low-population areas, is wiping out their population completely. Indigenous Melanesian Christians – they comprised 96% of the population in 1971 – now make up a 48% minority, with numbers expected to fall to 29% by 2020 if migration rates continue. Clashes between the indigenous Christians – and migrant Indonesian Muslims – have also resulted in riots, fires and injuries. “Land has been taken away, directly by Freeport … and indirectly, as the Indonesian settlers have appropriated it,” says Dr Agus Sumule, professor of agricultural socio-economics at the University of Papua. “The stresses [on indigenous people] are intense,” says Sumule. “They have been very negatively impacted.” The Indonesian government signed over to Freeport the right to extract mineral wealth from the Grasberg site in West Papua in 1967. A 2002 report from the International Institute for Environment and Development (IIED) details that land agreements were not negotiated with the Amungme until 1974, a year after the mine opened, and with the Kamoro in 1997. The compensation paid for Kamoro and Amungme land has been mainly in the form of communal benefits, such as the building of homes, schools and places of worship. The IIED report notes, “Perceptions of land rights and historic compensation claims are a continuing source of dissatisfaction and conflict in the mining area.” Recent census data shows Papua’s GDP per capita at $3,510, compared to the Indonesian average of $2,452. Yet Papua has the highest poverty rate in the country, nearly three times the national average. It also has the highest infant, child and maternal mortality rates in Indonesia, as well as the worst health indicators, and the poorest literacy rates. The scale of destitution is best observed from the highland Amungme village of Banti, just 20 miles down from the Grasberg mine. The river Aikwa, near Banti, is turned thick and silver with the tailings from the mine. Here, artisanal miners pan the tailings for gold. 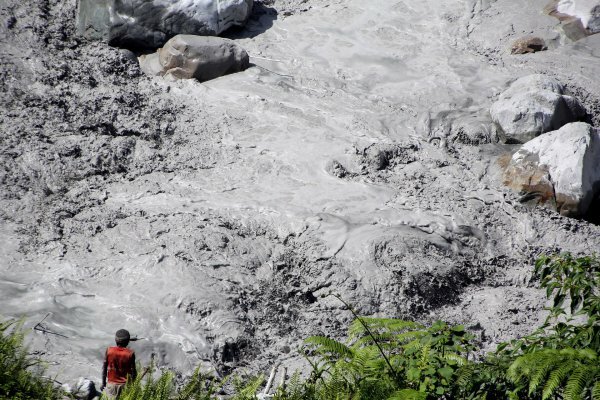 Estimates from Earthworks suggest that Freeport dumps as much as 200,000 tonnes of mine waste, known as tailings, directly into the Aikwa delta system every day. The practice has devastated the environment, according to Earthworks and locals, turning thousands of hectares of verdant forest and mangroves into wasteland and rendering turgid the once-crystal waters of the highlands. The tailings from the Grasberg mine are so rich with ore that Papuans walk for as long as a week to get here. Crowding the length of the river and the delta wasteland, thousands of unlicensed panners shore up small sections to slow the river’s flow and dig into the thick sediment on the side. Although some of these panners are located within Freeport’s official mining operations, they are not evicted or controlled in any way, they said. Instead, they claim they sell their findings to the police and military who work as security on the mine. (An anonymous Freeport source also confirmed this). One of the panners, Martine Wandango, 25, bends over her pail of water as she filters out rocks and searches for ore. “You can only survive with money, and you can only find money from gold,” says Martine, who followed her husband to the delta 15 years ago by walking 60 miles over the mountains from their remote highland village. The Aikwa river, which used to provide the Kamoro people with the staples of their existence.